June 25, 2018 (The Radiance Foundation) – Sometimes children need to be separated from their families. Thank God some of my siblings were separated from their parents. Some were physically or sexually abused. It's why we have a foster-care system, to protect children from neglect and abuse. My parents (you know, the "prolifers who don't care about kids after they're born") adopted and loved ten children and sacrificially cared for every one of us. Our family was made possible by children being protected and separated from biological parents whose actions caused them harm. MSNBC's Ali Velshi asks "What Would Jesus Do" in a bizarre segment using Scripture to justify illegal immigration. Velshi reads numerous passages including Matthew 19 & 25, Jeremiah 22:3 and others. He then solicits opinions from Father James Martin, a Jesuit priest who is known for radically taking Scripture out of context regarding homosexuality. In Matthew 19:13-14, the disciples were not allowing children to be brought to Jesus for him to lay hands on them and pray for them. Jesus said the "Kingdom of Heaven" (100% certain he wasn't referencing America) belongs to children, too, as well as adults. Jeremiah 22:3 states: "This is what the Lord says: Do what is just and right. Rescue from the hand of the oppressor the one who has been robbed. Do no wrong or violence to the foreigner, the fatherless or the widow, and do not shed innocent blood in this place." Having a compassionate immigration system that applies equally to all is just and right. More importantly, how does a rabidly pro-abortion news network preach to us about not shedding innocent blood in this place when the border situation is not about anyone detained being killed? Abortion, however, happens within our borders, shedding the blood of over 2,500 children violently separated from their families every day. Matthew 25 begins with how Christ will return and how He will "separate the people one from another as a shepherd separates the sheep from the goats." No irony there. This section, in context, talks about how we treat the least of these, we also treat Christ. So MSNBC is now advocating a theocratic approach to federal immigration policy? As a Christian, I am called to love people – not to eliminate punishment for wrongful actions. I don't support families being separated at the border unless there is verifiable abuse or neglect. Many parents put their children in peril by illegally crossing when they could cross legally. This latest political media tantrum is merely a continuum of resistance against having laws that prescribe what legal immigration is. It doesn't help, either, that judicial activists (who brought us Flores) have a well-documented history of bringing separate and unequal to the American public. Laws matter. Why should immigration laws be exempt? Certainly, human dignity is crushed any time someone becomes homeless. But should that person be able to assume arbitrary ownership of someone else's house? Should someone who's never attended Yale be able to walk across the stage and be given a degree (other than an honorary one)? Should we all remove our locks, our alarms, our gates, our fences and have a literal open-door policy to anyone who chooses to enter our property? Surely we must assume anyone who enters is of good character and has good reason to be in our home or business establishment. Sounds pretty foolish. And dangerous. Yet this is exactly how so many approach our national immigration policy. Everyone's good. You're racist or xenophobic if you suggest that some people are ill-natured (e.g. MS-13). You're heartless and cruel if anyone is turned away at our borders. You're not pro-life if you don't support amnesty or don't denounce children being separated from parents. Leftists are infamous for diluting the meaning of words – so are self-proclaimed conservatives like S.E. Cupp. When a word is forced to mean everything, it means nothing. That's exactly what is happening with the term "pro-life". Sorry, S.E. Cupp. You don't have to solve all of the world's problems to be pro-life. Yesterday it was mercury levels in water, today it's illegal immigration, tomorrow it'll probably be the perennial favorite – global warming global cooling climate change. The Pro-life movement fights to protect the unborn while physically, emotionally and spiritually caring for mother and child (while mentoring fathers as well). 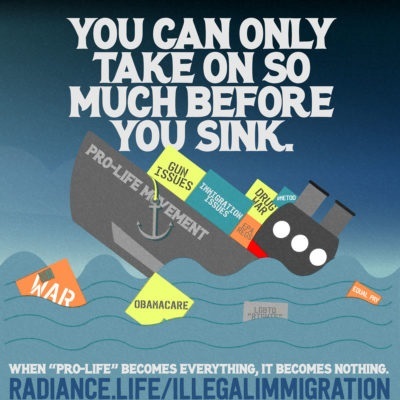 If every movement is a ship, this one is sinking. It seems to be the only one that has to take on the cargo of every single issue that exists in order to validate its mission. Thank God slavery abolitionists didn't navigate their cause with the same mentality. Imagine if anti-slavery advocates were pressed to address healthcare, housing and job security as prerequisites to ending the injustice of slavery. The evil institution would never have been abolished, and I just might be on an auction block somewhere in a town near you. Interestingly, I couldn't find a single online example of S.E. Cupp advocating for adoption (well, other than "gay adoption"), which is inarguably inseparable from the Right to Life. Also, there's no example of her decrying the separation of children from neglectful or abusive parents (hence, foster care) or from those who commit felonies. Should prolife leaders be demanding that we #KeepFamiliesTogether in these situations, too? In a culture that likes to pretend that we're all equal, why are some singled out to be above the law? I'm all about legitimate asylum and the legal process. My sister had to go through it as a child. She was a refugee from Vietnam. Millions of legal immigrants have to go through the arduous process to become an American citizen. And it's worth it all. I'm tired of the political exploitation of children, no matter the issue. Thankfully, President Trump just signed an Executive Order ending family separations. We have a broken immigration system that continues to crumble with each feigned political outrage and refusal, by Congress, to do anything tangible to fix it.